As one of the premier breed clubs for Fancy Poultry, we are dedicated to the advancement, excellence and preservation of both Bantam and Large Fowl Cochins. 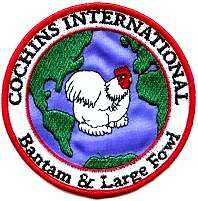 Our Purpose is to Promote, Encourage and Foster the Development of the Cochin breed of poultry to include Large Fowl, Bantams and Pekins (International). Our Mission and Focus is the Advancement of Exhibition Cochins. ​and be sure and visit our Show Results & Photos Page for more great winners! Special thanks go to Diane Jacky for allowing us to use her illustrations. We are proud to feature her artwork throughout this website. For more great Cochin images, please visit her website: www.dianejacky.com.